Professor Dr Hasan Zafar Arif of the London-based Muttahida Qaumi Movement said on Saturday that there was no such thing as MQM-Pakistan, adding that the party could not even conceive the idea of a minus-one formula. Addressing a press conference in London, Dr Hasan Zafar, a member of the newly formed 12-member interim coordination committee of the UK-based party, said party chief Altaf Hussain had already apologised to the nation for the contents of his Aug 22 speech. He added that not only was the MQM chief's apology not accepted, senior MQM leaders based in Karachi betrayed him. The interim coordination committee — nine members of which are based in Pakistan — was formed by MQM's London-based leadership in an attempt to regain organisational control of the party which it almost lost following the Aug 22 incendiary speech of party founder Altaf Hussain. “Members of a party stand with its founder in hard times…those who have abandoned Altaf Hussain have set an example of betrayal,” he said. Dr Hasan Zafar said it wasn't the first time attempts were made to bring down MQM, adding that the Mustafa Kamal-led Pak Sarzameen Party (PSP) also tried to break people away from the party. The newly-inducted RC member said all such attempts to damage the party have remained unsuccessful. Dr Hasan Zafar said operations were carried out against MQM, its members were arrested, the party's headquarters were sealed and cases were launched against Altaf Hussain but the party has remained in tact. He said the party had managed to hold its own even though the National Assembly, the Senate and the Sindh Assembly all stood up against the MQM chief. He said Altaf Hussain was the lifeblood of MQM and there could be no minus-one formula. “There is only one MQM…the founder of which is Altaf Hussain,” Dr Hasan Zafar said, adding that the ban against Altaf Hussain instituted in Pakistan should be removed, missing members of MQM be allowed to go home and the operation against MQM be stopped. “Those who are today MQM’s MNAs and MPAs came to their positions because of Altaf Hussain,” Dr Hasan Zafar said, adding that the MQM chief should not be treated as a guilty man simply because there is a case against him. The Rabita Committee member said MQM had not been registered in the name of Altaf Hussain as he had had to leave Pakistan before the party’s registration. Dr Hasan Zafar reiterated that MQM was a political party and its strength was the political process and the people and not court decisions. Today's press conference came two days after the Scotland Yard formally dropped its money laundering investigation involving Altaf Hussain and others. The much-relieved leadership now appears focussed on fighting back to show its detractors, including the Dr Farooq Sattar-led MQM-Pakistan, that the “minus-one” formula would not succeed. The MQM has been throes of a power struggle of late with Dr Sattar-led MQM dissociating itself from Altaf Hussain. The Sattar-led group also removed Altaf's name from the party's constitution and flag and expelled the London-based convener Nadeem Nusrat and certain key leaders. Following this, Altaf Hussain dissolved the rabita committee and all organisational wings and “appealed” to party legislators to quit their assembly seats and contest the election afresh since they had been elected in his name. However, no parliamentarian belonging to the party, except MNA Sufyan Yousuf, paid any heed to the MQM supremo’s repeated calls to quit. Later, Nusrat sacked Dr Sattar and recently he also announced terminating the basic party membership of Amir Khan, Leader of the Opposition in the Sindh Assembly Khwaja Izhar-ul-Hasan, MPA Faisal Subzwari and MNA Kishwar Zehra, who are now part of the MQM-Pakistan. It was only on Friday then that the London-based leadership announced a parallel set-up after consulting senior party leaders. Reality or made up reality? People of Karachi are rejecting MQM-London...Altaf is in desperation. The war is on with all the money got from different sources the rich London party. The Uk government is also watching the outcome. MQM based in London has no business in Pakistan. All of them are British nationals and should only operate and run their party in the UK. MQM London is not registered in Pakistan hence should not be allowed to work. Surprisingly this setup has beem placed immediately after getting clearance from UK in money laundering cases. We should be aware of the real architects and enemies of Pakistan, though not visible but too obvious. Plans are afoot to destabilize Karachi again. Altaf Bhai is the only hope for Urdu speaking Pakistanis who were the first to vote for Muslim League and creation of Pakistan. MQM was formed against injustice of majority rulers who sidelined the well educated and experienced bureaucrats and discriminated their children in all fields. Altaf Bhai Zindabad. MQM Zindabad. Pakistan Zindabad. It should be banned altogether for the better good of Karachi and the nation. Not even ordinary people that support the MQM will accept Altaf and his treacherous remarks regarding Pakistan, Altaf is finished, if any of the remaining leaders of MQM that are in Pakistan associate themselves with Altaf they will be shown the door as well. Impressive Show, the credit goes to real die hard workers and supporters. Long Live AH and MQM. Governmetn of Pakistan will not allow MQM-Landon base , simply they are our enemy and agent keep away all of them to keep peace in Karachi and our beloved county Pakistan. Long Live Altaf Hussein ! MQM Zindabad ! Farooq Bahi has no future without Altaf Hussein ! Mr Altaf Husain has chopped his own toes. I accept that he has serious grievences from Pakistan govt and establishments, yet he or any one can't be allowed to defame or hurt the name and honour of Pakistan. The sort of slogans he has used (as reported) are unforgivenable. Therefore, Noe ha has nothing to do with Pakistan. Thinking anything else, he must be living in dreams. So there is a London based MQM who are reportedly collaborating with an enemy intelligence agency, involved in illegal arms collection and also whose leader openly made a seditious speech against Pakistan. And we are expected to take up all this routinely in our strides as if it is normal business. Better still, no MQM at all. Altaf is history. Let Altaf enjoy London based politics and leave Pakistan to Pakistanis. Let the people of Karachi decide to whom to choose, and the fact that most of them rejected the minus one formula. All factions of MQM are in fact still one. They are playing dirty politics with the so called Muhajirs in Karachi there is no more Muhajirs in Karachi we are all born Pakistani may be our ancestor's were Muhajir but not we any more. So MQM should better quit this slogan or leave us alone there are other national parties who proved to be better than MQM so far. No more MQM-London in Pakistan. Dr Farooq Sattar is a sensible person and I would expect him to disregard what this clown and his cronies have to say. Focus on improving the lives of middle class and lower class Karachites. Siblings may love their elder brother but won't allow him to insult their mother. Pakistan is the mother of Muhajirs. Altaf Hussain forgot this fact. Altaf Hussain has gone rogue and is liability not only for MQM but for urban areas of Sindh as MQM is thir representative. These lackies are fighting for their political survival outside of Pakistan. Majority of Urdu speaking are fed up with AH who is a big distraction and due to him nothing is being done for urban Sindh improvement. The turning point was giving more rights at nine zero in the hands of Amir Khan who betrayed the entire MQM and cause a great damage to MQM. Altaf Hussain narrative has proved to be right from the beginning.He need right and justice in this country absent corruption and dictatorship in this country.MQM being a political party with the support of the people of the urban Sindh will remain united under the leadership of Altaf Hussain and all renegades will rejoin the party after the rulers realises that Pakistan cannot afford to loose Altaf Hussain.Pakistan,presently being rated as the most deprived nation in the world is not due to AH but the rulers of this country and the time has come that the people of this country must judge who is the enemy of Pakistan. @Muhammad I agree the actual rulers are the enemies of the country. They have diverted the attention of public to Altaf Hussain who said something in flow of emotions but not damaged financially or so. Our people must understand that Altaf Hussain is against corrupt mafia from the beginning of his politics and this mafia does not want to see him. Dr. Arif is right; there is no such thing as MQM-Pakistan in London. Just like there in no such thing as MQM-London in Pakistan. Well said, Dr.Hasan Zafar Arif. There is no such thing as London based MQM. Why? Any political party must have its leaders located in Pakistan. No running away from Altaf ! "There is no MQM Pakistan." Does that make any logical sense at all? 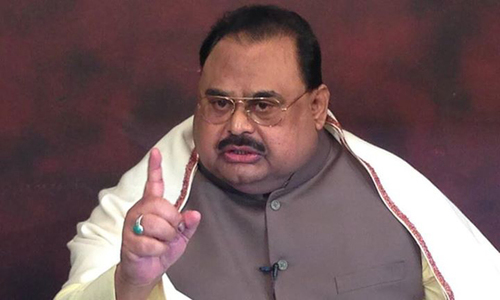 Altaf believes he is ruling from his kingdom far away. Why don't you come to Pakistan and have your press conference among the people you still claim to represent? What are you scared of? Perhaps, Justice! He should step aside. If he cannot come to Pakistan than he has no business to be part of Pakistani politics. There is only one MQM and it is run by Farooq Sattar. If the Londoners want to operate in Pakistan, they would be just one of the 50000 NGOs operating in Pakistan. @Sab Se Pehle Pakistan , l am from Urban Sindh and l reject your MQM. It's my democratic choice! !